Dalmatian Riviera occupies the area from the middle of the island of Pag and River Zrmanja in the north to Konavle and Cape Ostro on the south. Dalmatia is 400 km long and 70 km wide in the central part and covers an area of 11 960 km ², 1770 km ² of which is occupied by islands. It occupies the interior, rivers, coasts, and many beautiful islands which makes it one of the most indented coastlines in Europe. Dalmatia is divided into northern, central and southern Dalmatia and the entire region is dominated by karst relief and Mediterranean climate. North Dalmatia stretches from the island of Pag on the north to the town of Primosten on the south. The largest number of Croatian islands is located in Northern Dalmatia, all of which are not too big, except for Pag. There are Ugljan, Zirje, Dugi otok, Pasman and Kornat with the beautiful National Park Kornati. As far as three national parks are located in North Dalmatia : Paklenica, Kornati and Krka. The most important towns of North Dalmatia are Zadar and Sibenik which contain numerous historical monuments. Do not miss to visit Zadar and see numerous monuments as well as the most famous attraction – “Sea organ” and “Salute to the sun”. Sibenik is known as the oldest self-settled Croatian town on the Adriatic. During summer, you can enjoy numerous manifestations in Sibenik, such as the International children festival, Sibenik night, Evenings of Sibenik music and numerous others. One of the most visited destinations in Croatia, Vodice, is situated on the area of North Dalmatia. Vodice received the “tourist flower” which is awarded to places with especially attractive tourist offer. The northern islands are separated from the central ones by Cape Ploce near Rogoznica. Brac, Vis, Solta, Korcula, Ciovo, Hvar and Lastovo are considered as central Dalmatian islands. Hvar is one of the most popular tourist destinations on the Adriatic coast. Central Dalmatia is famous for its beautiful beaches which present an interesting tourist attraction. The most famous beaches of this area are: Zlatni Rat on the island of Brac, Punta Rata in Brela, Bacvice in Split and numerous others. Split and Makarska are the most visited towns in Central Dalmatia. In Split – an eternally young town which lives at its own, slow pace, you can see numerous historical monuments, savor the gastronomical offer and have fun in countless clubs and cafes. The town of Makarska, as well as the Makarska Riviera, is rich with natural beauties which will leave you breathless. This area is also attractive because of its natural and climatic characteristic, as well as its rich tourist offer. During summer, you can enjoy various programs, such as numerous classical and entertainment music concerts, Dalmatian folk song concerts, poetry evenings, summer carnival and numerous other. Hvar is another unavoidable destination in Central Dalmatia, located on the eponymous island. Hvar is a town with the sunniest hours per year. It is the center of island tourism and one of the most desirable and most visited destinations in all Adriatic. South Dalmatia is the smallest and southernmost part of the Croatian littoral.The island of Mljet belongs to the southern part of Dalmatia, as well as the Peljesac Peninsula and Elaphite islands which are considered the most beautiful group of islands. One of the most important parts of South Dalmatia is the town of Dubrovnik. It is one of the most famous tourist destinations on the Mediterranean. This is a town of unique and world famous cultural heritage. As one of the most attractive and most famous towns on the Mediterranean, it was added to the UNESCO’s World Heritage List. The beautiful national park Mljet is located on the eponymous island. It was also called the “green island” because it is one of the most forested islands in the Adriatic. You can visit the two astonishing lakes, crystal clear sea and rich cultural heritage. The Peljesac peninsula is also located in South Dalmatia and is the second largest peninsula in Croatia. It is separated from the island of Korcula by the Peljesac bay. You can visit many places on the island and get acquainted with their past. For those in search of activities, Peljesac offers numerous possibilities for water sports. You can experience countless natural beauties in Dalmatia; they will enthrall you and make you come back again and again. There are eight National parks and ten nature parks in Croatia, most of which are located in Dalmatia. The Krka National park is located near the town of Sibenik – it will astonish you with its seven beautiful waterfalls and its versatile flora and fauna. The Kornati national park is a beautiful group of islands located half way between Sibenik and Zadar. Kornati islands are famous for their exceptional beauty and rich sea ecosystem. The Plitvice National park is the largest and oldest national park in Croatia, as well as one of the most beautiful in the world. It is famous for its diversity of flora and fauna, numerous waterfalls, lakes, forests and galleries. The Paklenica national park is located on the south side of the Velebit Mountain and it enthralls with its astonishing canyons and creeks. It is rich with flora and fauna. This place is an exceptionally rich flora with 700 species, 35 of which are endemic. The Biokovo nature park is the highest mountain in Dalmatia – you can see Italy from its top when the weather is nice. It is characterized by deep pits, caves, abysses and beautiful forests. Zadar – is a town of exceptional history and remarkably valuable cultural heritage. It is located in the very heart of the Adriatic and in the north of Dalmatia. It is one of the more popular tourist destinations and has also been pronounced as the “entertainment center on the Adriatic” by the London Times magazine, as well as the “new Croatian cool capital” by the Guardian. The rapturous history of this town has left many scars upon it, as well as a valuable monumental heritage. The town of Zadar is a destination easily approachable by land, sea or air, and is directly connected with other larger towns in the Republic of Croatia. The town has an extremely well-indented coast, the islands and intact nature of which allures many yachtsmen. The town is rich with countless recent architectural achievements such as the first Sea Music Organ in the world, as well as the urban installation “Salute to the Sun”. The Sea Music Organ is an instrument placed on the shore which produces music as the sea moves. It is a spot where men’s idea and the energy of the sea and waves meet, a place to talk and think with the uninterrupted concert of the “Natural Orchestra”. Salute to the Sun is an installation that consists of multiple glass layers beneath which solar modules are placed over which a symbolic communication with the nature is actualized. This installation as the model of the Solar system is connected to the Sea Music Organ the sound of which transforms into a light game which begins after the sunset on the Riva. Sibenik – the oldest Croatian town on the Adriatic coast, situated at the delta of the river Krka. It is the city with the largest number of organ and stairs throughout Croatia. City of Sibenik boasts with its fantastic restaurants, shopping malls, cinema complexes and four forts, the most visited fort of which is St. Michael while the Fort St. Nicholas is considered as the best sea fort in the Mediterranean. Do not forget to visit the impressive cathedral of St. Jacob - the most important Renaissance building in Croatia. Split – the second largest city in Croatia and one of the most favorable tourist destinations on the Adriatic, as well as the center, an important traffic intersection and the largest port in Dalmatia. Split is an eternally young city that has lived at its slow pace which is easy to adapt to. The city is proud of its cultural and sporting events, beautiful beaches, scenic waterfront, Palace of Diocletian, and numerous monuments. The first resident of this city was the Emperor Diocletian, who had built the now famous Diocletian's Palace. Besides the palace, other cultural monuments you can visit are the Iron Gate, the statue of Gregory of Nin, the Cathedral of St.Duje, St. Francis’ church, the Peristil, concathedral of St. Peter, the city cellars, and many others. Split has a rich cultural and entertainment life, especially in summer, when the city squares, streets and other areas turn into a huge open-air stage. Fans of the delicious cuisine of this region can enjoy numerous restaurants and taverns. Dubrovnik – is a city of a unique and world-famous cultural heritage and beauty. As one of the most famous and attractive cities in the Mediterranean, it is registered in the UNESCO list of world heritage. Dubrovnik has been named "the pearl of Adriatic" because of its history and culture. It is enclosed by 2 km long walls, towers and forts which offer a magnificent view of the sea and city surroundings. Dubrovnik is a city with numerous beaches that provide comfort and entertainment during the day and night. This city has a rich offer; everyone can find something for themselves, regardless of age. - Church of St. Donat- is the most famous monumental buildings in Croatia and also the symbol of the city. - Cathedral of St. Stosia- the largest church in Dalmatia. This Romanesque building was built on two occasions during the 12 and 13th centuries. - Forums – the main square of Roman rulers where the entire public life took place, in front of the church of Sv. Donatus and the Archbishop's Palace. - Fortress Forte – the building began in 1567, and it was completed in just a few years. It was built on the site of the medieval suburb of Zadar – Varos of St. Martin. The fort was once separated from the city and the mainland by defense canals. - Five wells Square- the Square has an irregular shape of an elongated rectangle and it is enclosed on three sides. To date, there are surviving parts of the aqueduct that brought water directly from Lake Vrana and today this square with five wreaths is renovated and presents the most picturesque area of Zadar. - Kalelarga - the oldest street of Zadar, as some claim, even older than the city itself. Kalelarga extends from the people's square to the Forum. Besides being a symbol of the city, it is an iconic place of socializing, entertainment, processions ... and as they say, even the place where of the love of many citizens of Zadar begins and ends. - St. Michael Fort - the fortress from the 15th century is located on a hill, 70 meters above sea level, above the old city agglomeration and offers a beautiful view of the city of Sibenik and the Sibenik archipelago. - Museum 'Four wells' - located at the bottom of one of the old city wells that supplied the city with water, and now concerts are often organized in this place. - St. Duje Cathedral.- was built on the mausoleum of Emperor Diocletian, and there is an Egyptian Sphinx at the entrance to the cathedral from the second century BC. - A bronze statue of Gregory of Nin - great work by Ivan Mestrovic was placed in front of the north (Golden) Gate of Diocletian's Palace with a toe which is worn out due to local beliefs that touching the toe when passing by brings happiness and the realization of desires. - Fortress Gripe - Baroque Venetian fortress built in only eight months in the 17 century to defend against the Turks. - Split Peskarija - The only fish market in the world without flies. It was built next to the living sources of sulfur, the City Spa in the Marmont Street. - The city walls - one of the largest fortification monuments in Europe. They are 1940 meters long and give the typical Dubrovnik appearance, famous all around the world. - The Rector's Palace - a moderate and simple construction, famous for historical events of Dubrovnik. - Sponza Palace is a beautiful palace of the customs - Divona, called Sponza, was the lifeblood of trade, while today its square hosts the opening ceremonies of the Dubrovnik Summer Festival. - Onofrio Fountain- built around 1400, as a symbol of the construction of urban water supply and spring water from the river 12 km away from Dubrovnik. - Monastery "Mala braca" – the library of the monastery is one of the most important in the world, and the monastery is still one of the oldest pharmacies in Europe, founded in 1317. - Lovrijenac - monumental and impressive fortress outside the city walls, located on a 37 m high cliff. Fort Lovrijenac is known worldwide as an excellent stage and the equivalent to the Danish castle of Elsinore for a performance of Shakespeare's "Hamlet." Dalmatian gastronomy is based on naturally grown and fresh seasonal vegetables, fresh mussels, clams and fish from the Adriatic Sea with the addition of local olive oil and spices such as rosemary, bay leaves, fennel, sage and basil. Capers and olives are indispensable- they are served with all dishes and especially with the Dalmatian prosciutto and sheep cheese. A special treat in Dalmatia is the fish which is served in many ways; grilled, or cooked in stew. Shellfish and crustaceans are prepared in sauce. Famous specialties are the meat stew with gnocchi and roasted lamb. The specialties of the Dalmatian hinterland are the Sinjski Arambasic (meat wrapped in small cabbage leaves), frog Baudot, fried frog legs, Cetina trout ... A characteristic delicacy in the valley of Neretva is the eel or frog stew, and venison. Mallard (coot) is a real specialty and an unforgettable experience. Savor the well-known green risotto and minestrone in Mlini and Cavtat. Recipes of traditional Dalmatian dishes can be found on our blog. Your stay in Dalmatia can be very exciting. This area offers a variety of sporting activities tailored according the average physical condition, as well as for those in good shape and adventurous spirit. Enjoy extreme tourism - discover the magical world of the underground: caves, caverns, pits and sinkholes in the area of Split and Omis, rafting on river Cetina and Zrmanja, hiking, canoeing and rock climbing, paragliding from Biokovo, free climbing in Paklenica National Park, trekking and mountain bike trails on the mountain Velebit and Paklenica National Park. There are various possibilities for diving, sailing, tennis and other sports. While staying in one of many resorts and towns in Dalmatia, do not miss to explore and get acquainted with the beauty of this area. Take a boat trip to the islands of Ugljan, Dugi otok, Hvar, Brac, Solta and others. Explore all of the islands and enjoy the scenic ride to the small islands and bays. Go on an unforgettable excursion to the National Park Kornati, an archipelago of about 150 islands, 89 of which are situated in the national park. The archipelago is characterized by scarce vegetation, lack of water streams, crystal clear waters and a number of coves and cliffs. Visit the National Park on the island of Mljet, where you will enjoy a leisurely stroll along the Big and Little Lake. A 12 century monastery is located in the middle of the lake, on the island of St. Mary. The Krka National Park covers an area along the river Krka, which runs through the 75 km long scenic canyon. Even though you can reach it by car, the most beautiful access is by ship. You will be thrilled by the cascades, waterfalls and lush greenery. The Paklenica National Park is a space of unique touch between the sea and mountains, rich with forests, canyons and numerous caves, suitable for mountaineering. Also do not forget to visit the Vransko Jezero Nature Park- a pristine natural habitat for birds. Visit the nature park Telascica on Dugi otok, which is rich with marine and terrestrial flora and fauna such as dolphins, bats and endemic birds. When you visit the nature park Biokovo not forget to visit the garden Kotisina. It is a botanical garden where native vegetation of Biokovo is preserved. Do not forget to visit the Elaphit islands, made of a group of islands: Sipan, Lopud, Kolocep, Jakljan, Ruda, Golec and Crkvine and some smaller islands. The Elaphits contain beautiful palaces that were built by aristocrats. There are numerous places of entertainment in Dalmatia for both young adults and for older ones. Each year in the summer, musical evenings are organized at St. Donat in the city of Zadar, as well as a large tourist festival "Full Moon Night" in July and then the fun lasts until the early morning hours. Do not miss the great folk feast Days of "Maraska" which lasts a few days with plenty of Maraschino liqueur. In Sibenik have fun with the Sibenik cultural summer, the Sibenik night, International Children's Festival and the evenings of Dalmatian songs. 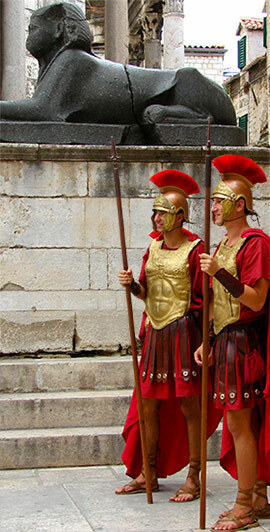 Split will entertain you with "Diocletian's evenings" which are held in the cellars of the palace, followed by concerts and other events that take place inside the ancient walls and the famous Riva. In Omis, pirates’ evenings are held, interesting for children and adults. In Dubrovnik, you can relax with a number of musical evenings, drama performances in the unique atmosphere of the fortress and the palace which at the time of the Dubrovnik Summer Festival becomes an open stage. For those with a livelier spiri, there are clubs for a long night on the island of Pag, especially on the Zrce beach, while in Zadar you will be welcomed by Forum disco and urban centers Gotham and Kult Café, in which you will experience the fun until the morning hours. In Sibenik, visit the club's "Inside", in Vodice disco "Hacienda" which is known throughout the Adriatic, in Primosten disco "Aurora". The younger population in Split and its surroundings can be enjoy in many discos and clubs such as "Tropic," Vanilla "," Hemingway "and numerous others. In Dubrovnik, have fun with the thematic parties, famous DJs in Lazareti or on the famous Dubrovnik beach Banje.